Yes, it’s Monday morning, and we’re back in front of the computer. But at least we’re not in prison. That’s the cheery thought inspired by Prison Expressions, a line of greeting cards designed for that special incarcerated loved one in your life. 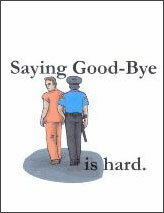 The cards are designed by a Kansas woman “who could never find the right message to send to her two inmate brothers,” according to a story in the Sun. It’s a thoughtful idea, but do the sentiments have to be so depressing? One card says: “You know the choice you made when you were out. You know that it did not only hurt you, but it hurt us too. However, we still love you. Love always, Family.” Another says: “When the cell door closed, my whole life was gone in the blink of an eye.” Christ, just shoot me now.